The OpenLM Groups License Activity Report tool provides the ability to present an historical account of groups’ license usage sessions. OpenLM provides an easy interface for monitoring software license usage. It does so for a constantly expanding variety of concurrent license manager types, e.g. FlexLM / Flexnet, Sentinel RMS Reprise RLM, MathLM, DSLS, Sentinel HASP, LM-X, IBM-LUM etc. OpenLM is capable of reporting usage according to Users, User groups, Hosts, Host groups, Organizational Units and Projects. 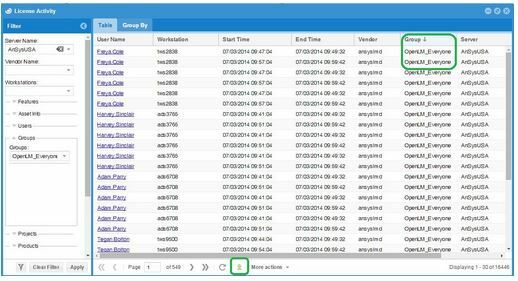 OpenLM’s web application – EasyAdmin – presents users’ accumulated data in a variety of real-time windows (e.g. “Active Products” and “Feature Usage Status” windows), and historical usage tables (e.g. “License usage” and “License activity” windows). See the OpenLM screenshots document for more information. The OpenLM Groups License Activity Report tool provides this ability. The users who populate this list are members of groups in the OpenLM database. These groups may be introduced either manually, or by means of LDAP (Active Directory) synchronization. Synchronize Active Directory, and add users manually for more information on OpenLM Groups. In the image above, the OpenLM_Everyone group has been selected for the time period from 07/03/2014 until now. In order to provide information for the Groups reporting tool, the information needs to be exported to a CSV file, using the green arrow icon (marked by a red rectangle).